Councilwoman Lorie Zapf is expected to be attending the upcoming OB Town Council meeting, this Wednesday, January 27th. This could be a rare occasion, as the Councilwoman who represents Ocean Beach and Point Loma as part of her District 2, has a reputation of staying away from public meetings in OB. Whether by plan or coincidence, Zapf was introduced to the community at the OBTC meeting exactly one year ago. 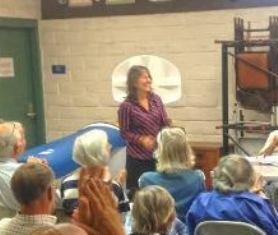 And she did attend the Sunset Cliffs Natural Park committee meeting in July. Also on the Council’s agenda is an introduction to the new Coastal Park Rangers and the presenting of awards to the winners of the 36th Annual OB Holiday Parade with their plaques. The Town Council meeting is at Masonic Hall at 1711 Sunset Cliffs Boulevard, and begins at 7pm. 7 pm at the Masonic Lodge on Sunset Cliffs. I’ll be there to ask Zapf some questions. It’s funny – the photo makes it look like there’s a halo around Zapf’s head.